After a devastating tornado destroyed 10 Joplin schools in 2011, the district and community rallied to chart a course for uninterrupted education for their students. After spending three years in an interim facility, Joplin High School students now have a permanent facility constructed on the site of the former building. 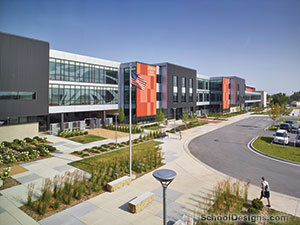 DLR Group's design incorporates the concept to prepare students for a "Career to College" experience. The center of the school, known as "Eagle Alley," is where this concept comes to life. The coffee shop, student store and lease spaces offer business opportunities for entrepreneurs. Students can experiment with a career pathway as in-depth as they would like in a flexible and collaborative environment. Career pathways include Technology, Broadcasting, Sciences, Hospitality, Culinary Arts, Automotive Sciences, Engineering, Medical, and Construction. Technology is a seamless component of the building infrastructure and an asset to flexibility for teachers adn students. The school's landscape design provides a "park-like" setting with themed courtyards used for outdoor experiements, studying, dining and socializing. The four main courtyards: Arts; Main Commons; Science; and Marketplace and Legacy.